Many Impressive smartphones have been launched recently which come with impressive high end specifications. Seeing the UI of LG G2, it is quite clear that they have targeted Samsung Galaxy S4. Both these smartphones will give you excellent performance and come with many software features. 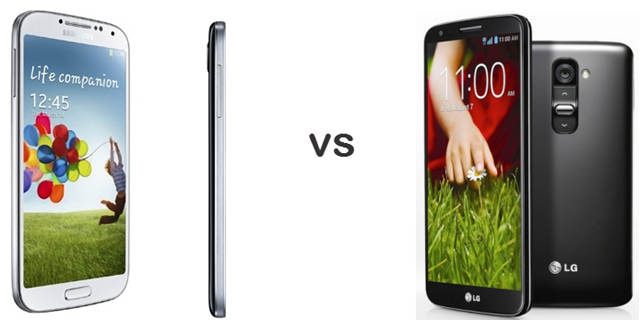 Let’s compare these Android giants head to head! LG G2 has a massive 5.2 Inch Display, but the phone compensates for the increase in display by a corresponding decrease in Bezel on the sides. The hardware Navigation buttons on the panel have also been replaced by software buttons to further conserve space. The back body design is also conventional as it holds the Power key and the volume rocker below the camera. The body dimensions of LG G2 are 138.5 x 70.9 x 8.9 mm and the phone weighs a moderate 143 grams. The Samsung Galaxy S4 has the conventional Galaxy series design with body dimensions of 136.6 x 69.8 x 7.9 mm it is 1 mm sleeker. It also weighs less at 130 grams but both the smartphones are considerably lighter and easy to hold. LG G2 sports a 5.2 Inch display with full HD 1080p resolution with 423 pixels per inches. The display type in LCD IPS Display which LG has perfected over the years and the resulting display on LG G2 is one of the best displays that we have seen. The display will particularly be a delight for those who like to read on their smartphones. The Samsung Galaxy S4 features a slightly smaller 5 Inch Super AMOLED display. The display resolution is 1080p Full HD amounting to 441 ppi. The Super AMOLED display will ensure darker darks and will be more suited to watching videos. Both these Displays will give you with vibrant colors. The Display in LG G2 will be protected by corning gorilla glass 2 while the Galaxy S4 comes with corning gorilla glass 3 protections which makes it more resistant to abuse. LG G2 is powered by 2.3 GHz quad core Snapdragon 800 Chipset with Adreno 330 GPU which is definitely faster than Samsungs Galaxy S4’s Exynos 5 Octa 5410 Chipset. The Exynos Chipset consists of a 1.6 GHz Cortex A 15 processor and 1.2 Ghz cortex A7 quad core processor which share work load among themselves. None of these processors will lag in general purpose usage, but when we talk about Graphic Intensive gaming, LG G2 will have an Edge. Both of these smartphones come with similar Camera specifications. The LG G2 has a 13 MP camera at the back which comes with Optical Image stabilization so that you don’t get the blur in your images due to vibration. This camera is capable of Full HD 1080p video recording at 60 fps. A 2.1 MP front camera capable of full HD video recording is also present for video calling. The Galaxy S4 also comes has a 13 MP shooter at the back capable of full HD 1080 p recording at 30 fps This camera does not have Optical Image stabilization. The front camera of 2 MP is capable of Full HD video recording. Both these smartphones have 2 GB of RAM backing up the processors. The LG G2 comes with non extendable 16 GB and 32 GB storage in two variants. The Galaxy S4 has 16 GB storage with support for MicroSD card up to 64 GB. 32 GB variant is also available in India. The microSD support makes LG G2 much more attractive compared to LG G2 in this regards. The battery capacity of LG G2 is massive at 3000 mAh and will give you ample video playback time and 3G talk time of above 20 hours. LG G2 also features a Graphic RAM which reduces communication between GPU and Static Display and saves up to 10 percent of battery backup. Samsung Galaxy S4 has 2600 mAh battery which will give you up to 17 Hrs of talk time on 3G and up to 370 hrs of Standby time. Battery is an area where more is always better. LG G2 will outperform Samsung Galaxy S4 in this arena, although both these devices will provide you with ample talk time. Both these phones come with many software features. The LG G2 User Interface looks like a copy of S4’s TouchWiz UI. The UI in LG G2 is quite cluttered and contains all almost all features of S4 and more. LG G2 comes with software features like KnockOn which lets you unlock the lock screen with Double Tap, it also features multitasking features like Qslide and Slide Windows. It includes features first introduced by Samsung like Video Pinning and Easy Answer apart from many other features like Clip trays. The LG G2 provides you with various customization options and all these features together get a little messy. Both these smartphones are high end Flagship devices from Tier one Global smartphone manufacturers. LG G2 has the edge as far as hardware specifications are concerned and will be definitely faster. However you can’t condemn S4 as “slow” as far as day to day operations are concerned. The TouchWiz UI of galaxy S4 has matured and perfected over the years where as LG G2 UI appears messy. Both of these phones will perform well in day to day usage, but if you are an extensive gamer, LG G2 will work better for you.